Sentient robots really need to rethink their public relations strategy. The mainstream media will have you believe that they're all T-800s , IG-88s , chrome skulls, and glowing red eyes, but as Metroid-inspired indie game The Fall proves, not all killer robots are evil. They're all pretty creepy still, but some of them kill on our behalf. In The Fall, you play as an A.R.I.D., an artificial intelligence onboard an armored combat suit for meatbags/humans. It starts when you discover your onboard human is unconscious and in need of medical attention. In addition to questioning your programming, your attempts to get that medical attention will have you exploring a sci-fi installation with a blend of platforming, shooting, and point-and-click adventure gameplay. 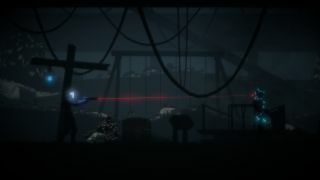 That kind of sounds like it adds up to a Metroid-type experience, and developer John Warner also lists Limbo as an inspiration, which I think you'll agree comes through in the above, mostly dark trailer. The Fall will release episodically, with the first episode hitting Steam May 30 for $10. Developed by Over The Moon, the game was successfully funded on Kickstarter last year, surpassing its funding goal of $17,000 with a total of $38,155.